It is great having visitors, and in Rome we get many. Friends need a map, and a steady supply of prosecco/wine/limoncello/amaro, that is easy. Relatives coming with children, that is something else. They will ruthlessly rummage though your fridge and cupboards, looking for ketchup/hot dogs/juice/Nutella (insert various items we do not have.) So I am tidying up the fridge to make room for child-friendly food and large bits of watermelon, while looking forward to touring gelaterias and finally watching “Frozen” with my nieces. I bringing this to The Novice Gardeners Fiesta Friday 22, with apologies for being late, and am off to browse the gorgeous dishes there next. Pre-heat your oven to 190C. Press out or roll out tart base in a 25 cm tin. If you have a loose bottomed one, super. Pre-bake base for ten minutes. I pricked the base several times with a fork so ii would not puff up too much. Best to trim extra overhanging pastry after this first bake, as pastry will shrink during baking, though I generally forget that! Wash the asparagus, and cut it into 3-4 cm pieces, saving some tops to decorate the tart. Not too large pieces, as you want them to cook through. Dice the smoked salmon. Crumble the blue cheese. Take the half-baked base out of the oven. 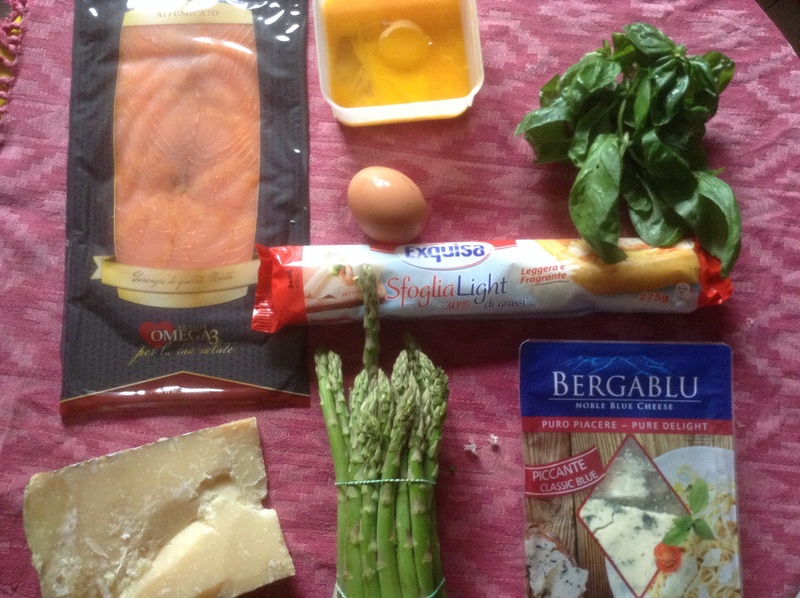 Distribute asparagus and smoked salmon on pastry base, crumble over blue cheese and fresh basil. Beat eggs and milk, add pepper, and pour this over asparagus and salmon. Crumble hard cheese on top. Bake at 190C for 45 minutes until firm and nicely golden. 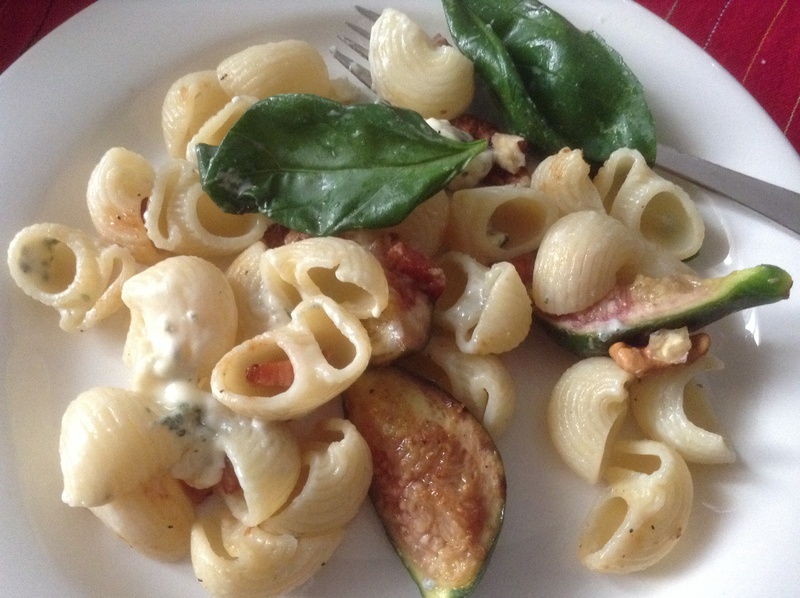 Notes: This was concocted to use up blue cheese, left over from pasta with fresh figs, blue cheese, pancetta and basil. I wondered if it would be a bit odd with the smoked salmon, but it was very nice, and was good cold for lunch the next day too. PS I confess, we broke down and just bought a small second fridge. I had been saving up for a romantic sixth anniversary weekend away, but between the World Cup and a deadline for my husband, that was not possible. So I ordered a fridge. Hopefully it arrives before the next guests do. 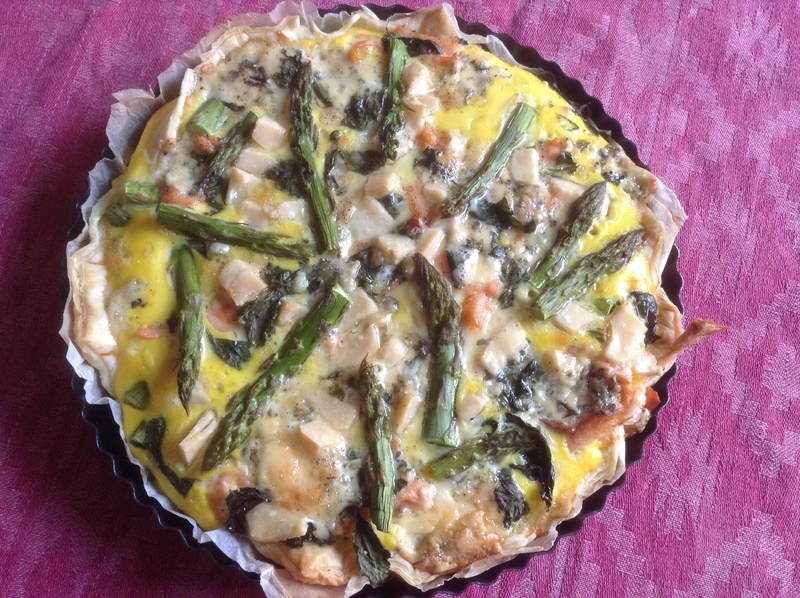 This entry was posted in baking, food and tagged blue cheese, Fiesta Friday, smoked salmon, tart on June 29, 2014 by krumkaker. 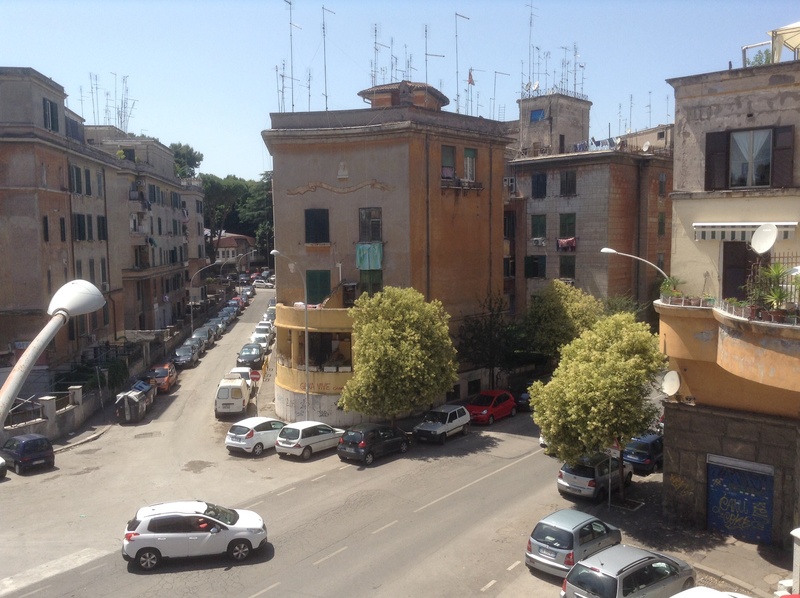 Another warm weekend, but Rome is still not really hot, which is wonderful. 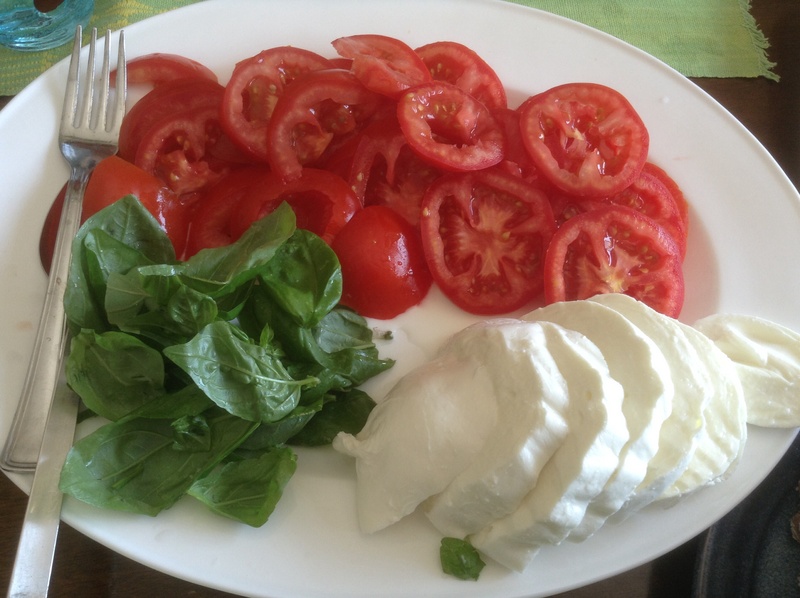 So here is a sourdough loaf with potato, which I am bringing to Fiesta Friday 21, along with this gorgeous mozzarella di bufala from Campania,with tomatoes and basil, so people can assemble their own caprese salad along with some freshly sliced prosciutto. Many thanks to the hosts! Stir the sourdough starter with the water and the leftover potatoes, skin and all. Add the flour and mix well. Cover with plastic wrap and let rest for 20 minutes. Add the salt. Mix well. Add more flour or water if you think the dough needs it. My dough was quite wet so I added a little more flour: the dough should be pliable, but not too gloopy. Cover the bowl and let rise for a few hours at room temperature. Rome is warm, so in my 29C kitchen it doubled in two hours, it might take your dough longer. Fold the dough a few times along the way (just fold in the bowl, using a spoon or spatula). You will feel the dough becoming more elastic, and it will increase nicely in volume. When ready to bake: heat your oven to 250C, with a cast iron pot. When it is properly hot, take the pot out carefully. Invert the dough onto a piece of baking paper, slash the dough, and put the bread in the pot. (The baking paper just bakes it easier to get the bread out afterwards.) Bake at 250C for 30 minutes with the lid on, then 15 minutes more with the lid off, until the bread looks done and the base of the bread sounds hollow if you tap it. About 45 minutes in all, depending on your oven. Cool before slicing. Notes: this time my starter was fed with barley flour, which worked better than I expected. Normally I use rye flour for the starter. 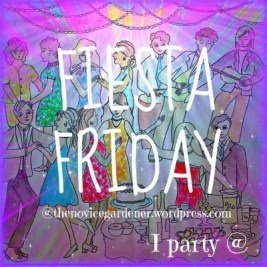 Now, I am off to browse the wonderful offerings of Fiesta Friday 21, an amazing selection I see! PS Sunday view from our lunch. Half the neighbourhood must have gone to the beach, it was very quiet here in Garbatella today. We enjoyed our mozzarella, and watched “Heathers”. Oh, and I made macarons for the first time! Not entirely disastrous! Post to follow. 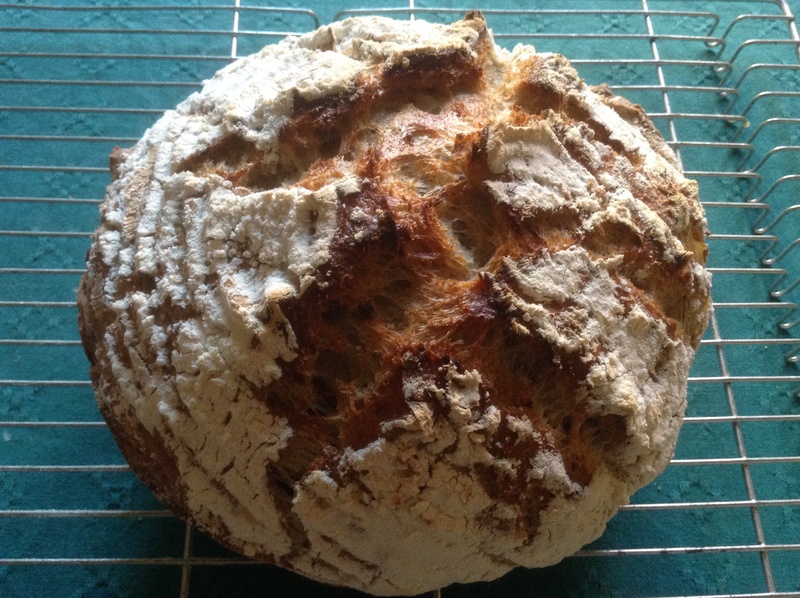 This entry was posted in baking, food and tagged Fiesta Friday, potato, sourdough on June 22, 2014 by krumkaker. Is the World Cup impacting your life? Or holiday plans? I usually ignore football, but one week in and it keeps getter harder. 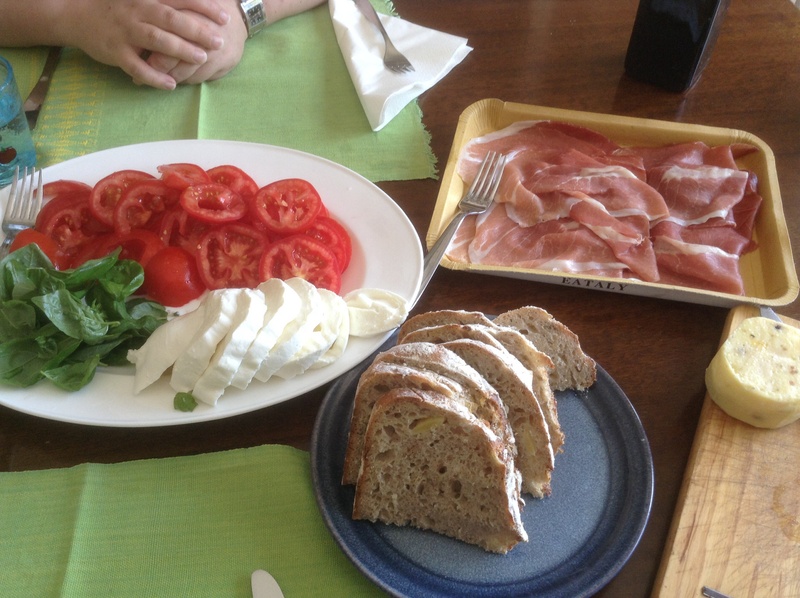 Normally I arrive home, and make dinner with my lovely husband in a leisurely way, while we chat and catch up. Now, as the World Cup games start at 6PM, 9PM and midnight Rome time, there are brief windows to cook and eat at half time or between games, so quick simple meals are required. 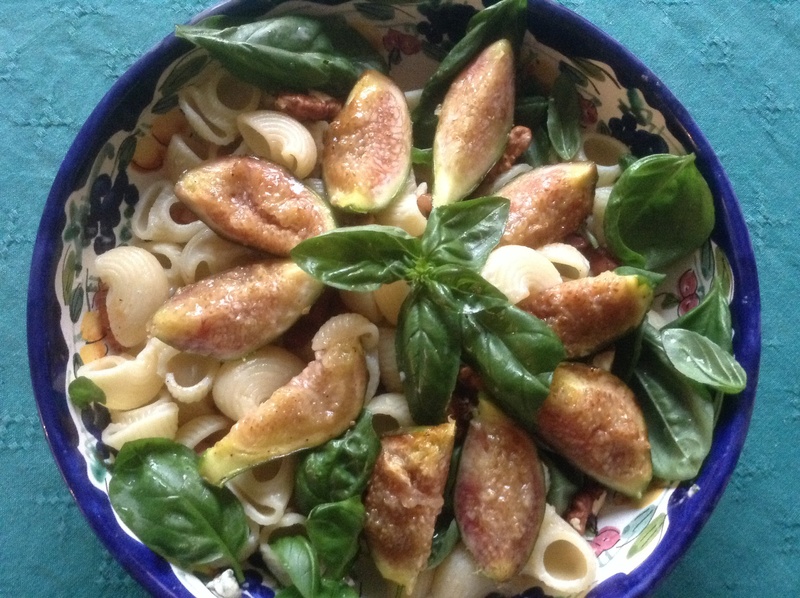 Here, we had pasta with fresh figs, blue cheese, pancetta, walnuts and basil. Boil the pasta in salted water. In the meantime, if including pancetta, bacon or such: dice the pancetta and fry it until crispy. Then move to a small plate covered with paper towel, so that soaks up some of the grease. 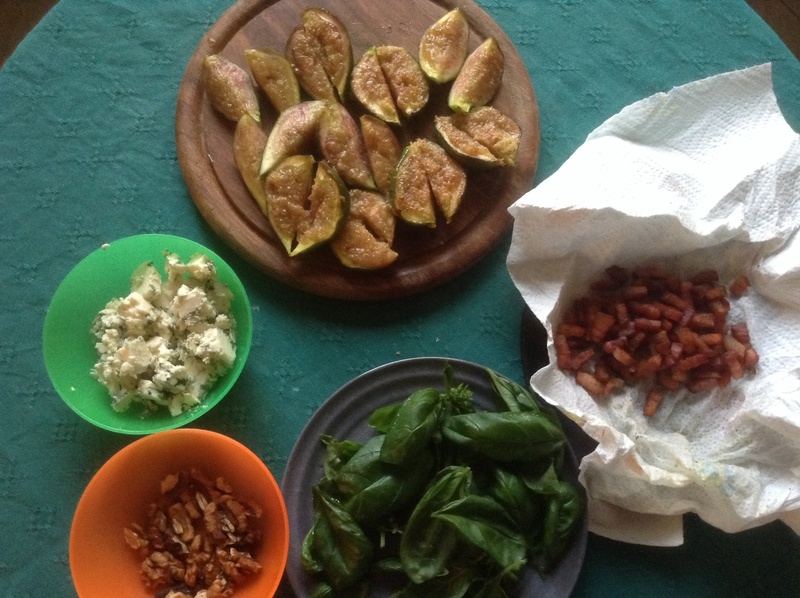 Leave a little pancetta fat in the frying pan, you will use it for the figs. While the pasta is finishing and the figs are softening, roughly crumble the blue cheese. Shell and break up the walnuts. Rinse the basil, shake off the water and take the leaves off the stems. Almost there! Now, take out half a cup of pasta water and drain the pasta. You might not need much of the starchy water, but if the pasta looks a bit dry, a few splashes will help and is a good alternative to adding cream. Time to assemble: pasta into a bowl, then blue cheese sprinkled over. Stir it a couple times; I added a small splash of pasta water to loosen the pasta and cheese. Not too much, though. Then toss in the rest: crispy pancetta, walnuts, basil. Finally, place the fig quarters on top and serve. Salt and pepper optional, as is watching the second half of the game…. 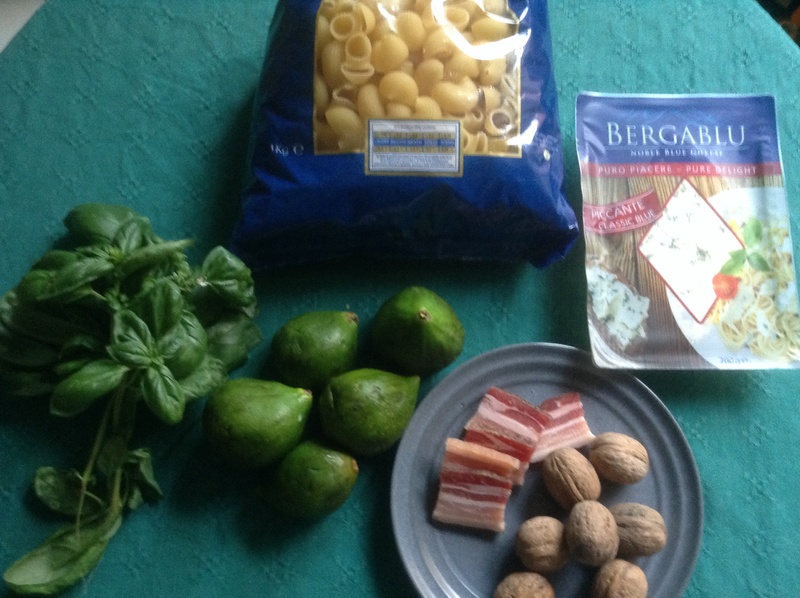 This entry was posted in food, fruit and tagged blue cheese, figs, pasta on June 20, 2014 by krumkaker.